Employers never want their staff to come to harm while on the job, and most do the best they can to prevent illness and injury at work. The Occupational Safety & Health Administration (OSHA) is the last word in workplace safety, and their standards help ensure safe and healthful workplaces in any industry. So, when it comes to insulating for personnel protection, what are the standards? Does OSHA specify a minimum hazardous temperature for exposed piping and other heated mechanical equipment? 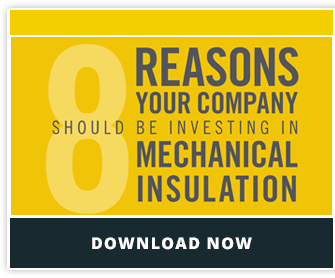 I talk frequently on this blog about the benefits of mechanical insulation for saving money and energy, but one of the most important aspects of insulation is protecting staff from thermal burns or other related injuries. Although there are no specific OSHA standard or guidelines about exact temperature, OSHA does consider exposed heated surfaces, if there is a potential for injury, to be a hazard and issues citations if employees can come into contact with such surfaces. For example, in 2010 Pinnacle Foods Group was given a $2,975 penalty for exposing employees to thermal burn hazards in the form of uninsulated pipes. The steam and hot water pipes, which operated at about 180 degrees Farenheit, were located in multiple prep areas and adjacent to the walking/work surfaces. The two potential solutions that were mandated by OSHA in this case were either to insulate the exposed pipes with the correct materials, or to install barriers or guards to prevent employees from coming into contact with the hazardous surfaces. Clearly, mechanical insulation is the much simpler way to correct this violation. In addition to thermal burns as a direct result of contact with an exposed heated surface, there are other concerns that employers need to consider when insulating for personnel protection. Reducing employee exposure to radiant heat is extremely important for preventing heat-related health problems such as heat exhaustion and heat cramps. As OSHA puts it, any workplace where “operations involve high air temperatures, radiant heat sources, high humidity, direct physical contact with hot objects, or strenuous physical activities have a high potential for causing heat-related illness.” These workplaces could include foundries, brick/ceramic plants, factories, electrical utility rooms, bakeries, laundries, commercial kitchens, chemical plants, mines, steam tunnels, and any manufacturing facility. In the thermal images below, we can clearly see the effects of surface giving off radiant heat. If the pipes below were insulated the amount of heat loss would be much less. OSHA requires that employers provide protection against noise exposure when workplace noise reaches certain decibel levels. One of the easiest and most effective ways to reduce mechanical noise in the manufacturing industry is to insulate mechanical systems. Mechanical insulation is an effective solution for providing acoustic barriers, reducing noise, and dampening vibration. Sound attenuation with insulation can require both standard and specialized insulation materials to encase or enclose the noise source, forming a sound barrier between the source and the surrounding area.